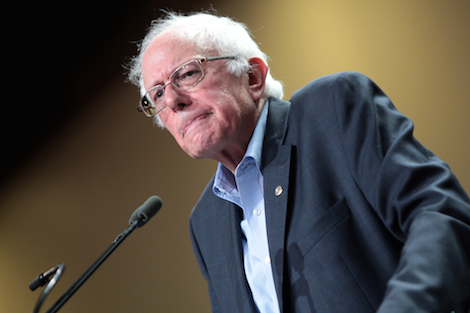 Washington Monthly | How Would a President Sanders Approach Trade Policy? How Would a President Sanders Approach Trade Policy? During the last Democratic presidential debate, Chuck Todd opened a question to Bernie Sanders by pointing out that he had never supported a trade deal during his time in Congress. He then went on to ask whether or not as president, that would allow a country like China to set the rules of trade for the world. Here is how Sanders responded. That answer clarified a few things, but left a lot of questions. I notice, for example, that Sanders says that he supports “trade,” but never said that he would support a “trade deal.” One has to assume that when he calls for “fair trade,” he is imagining a trade deal that he thinks if fair to American workers. If that is a correct assumption, then it would be helpful to hear what kind of trade deals we could expect a President Sanders to negotiate. When he points to the problem of American workers having to compete with people in Vietnam who make 56 cents an hour, would he attempt to negotiate a $7, $10 or $15 an hour wage for the Vietnamese people via a trade deal? Or would he simply refuse to trade with any country whose minimum wage was below ours (or what we want it to be)? Perhaps a trade deal negotiated by President Sanders would simply insist on worker’s rights to organize for a better wage – as do the side deals the Obama administration negotiated with Vietnam, Malaysia and Brunei via the TPP. But as we’ve seen in the past, there are significant problems that arise in enforcing those commitments. How would a Sanders administration deal with that? What Sanders raised as concerns about trade deals are actually the result of dealing with a global economy. Most liberals who reject the TPP seem to recognize this reality and the attempts in recent agreements to narrow the divide. They tend to have other issues with TPP. For example, David Cay Johnston (like Sen. Elizabeth Warren) has zeroed his critique in on the expansion of the Investor-State Dispute Settlement provision. I assume that Sanders shares that concern. So it would be helpful to know what he envisions as an alternative. Many have noted that on questions of foreign policy, Bernie Sanders does not present his case as strongly or effectively as Hillary Clinton. But when it comes to trade policy, it is clear that Sanders is very passionate. My concern is that he has expressed that primarily in terms of what he is against. We have heard almost nothing from him about what he envisions a fair trade agreement would look like. I am not suggesting that, in this campaign, Sanders needs to lay out specific detailed answers to the questions I’ve raised. But it would be helpful if he would identify some goals and principles on how he proposes to deal with trade issues. As many pundits have pointed out about Republicans, to merely be against something is not enough.